Traveling in buses can be really cumbersome and tiring for some. Especially if it’s a daily routine where one has to take a bus every day to their place of destination. However, it doesn’t need to be what you think about travel. 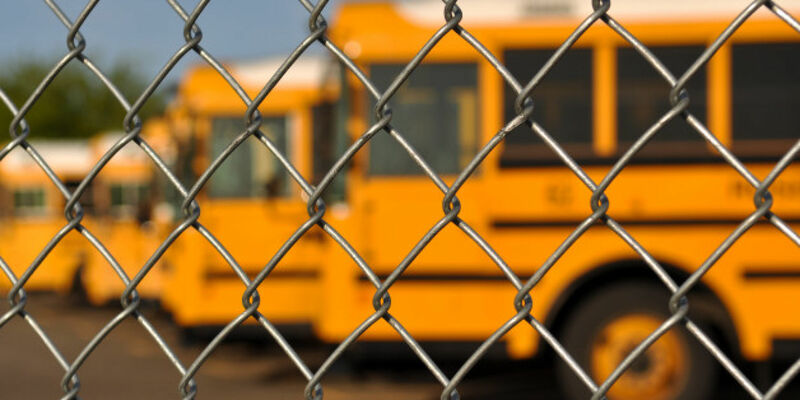 Best school bus manufacturing companies can incorporate best features to make your travel delightful and comfortable. So, go ahead to choose the best way to travel and leave the cumbersome aspect behind you. Enjoy every bit of your travel now by choosing the right options. School kids especially need a comfortable, relaxed and more importantly a safer way to travel. In short, kids require buses that have the essential features to provide a safe and comfortable journey. While thinking about the safety aspect, school buses are the perfect means to enjoy a safe and comfortable journey back and forth to school. Leading bus manufacturers engineer buses through a series of steps. Based on the requirement every bus is fitted with the designated parts. So, buses are built based on their requirement from the customers. For instance, luxury buses need more luxurious elements built into it; whereas School buses, on the other hand, need more comfort and safety element incorporated into their design. When a school bus company in India manufactures a bus, every minute detail is considered while building the bus. For instance, school buses have a retractable low first step that enables students to easily board the bus. They are equipped with stop signs as well to ensure safety on roads. What are all the safety features on a school bus? Every bus is coated with a golden yellow color to comply with the standards and further improve the visibility during extreme weather conditions and night times. Retractable low first step helps your kids to alight the bus more easily with least effort. It avoids a kid from having an injury. The anti-skid vinyl flooring prevents a kid from falling down inside the bus even in wet conditions. Every bus is installed with a stop sign that signals the traffic around to come to a halt because kids are either boarding the bus or exiting them. The large emergency door provides a way to exit the bus in case of an emergency. The strap handles along the rail located on the roof provide an extra grip for students who need to move through the aisle. A well stocked, first-aid kit is kept inside the bus in case of any emergency. The comfortable seats designed to perfection ensure that the kids travel to and from the school with great comfort. The modesty partition separates the driver area from the passengers so that the driver would not be disturbed during driving. Seats with handles and a net like a document holder are an added comfort for the students during their travel to school. The school bus body building process is a series of steps right from design up to testing the bus towards delivery. The coach manufacturers follow latest engineering mechanism to ensure manufacturing quality buses that meet the specifications of the customer. There are of course many safety elements that are involved during the bus building process. They rely on their research findings to provide buses that catch the attention of our eye. The research findings enable school bus company in India to build new designs for a fresh new look. There are many types of buses, and each of them has their own set of features based on their travel requirement. School buses are one such kind that provides a comfortable ride and ample safety elements for the students. Recommended: How Buses Are Making World The Better Place? Though the school buses provide excellent safety features, yet the school students need to take necessary precautions during their journey. Parents should be with their kids when the bus arrives at the spot. Kids must stand at least 3 steps behind the platform and board the bus one by one. Kids should be taught to board the bus only after the bus comes to a complete stop. If the child needs to cross the street, they should take at least five steps in front of the bus, look at the driver and further cross the street after the driver signals. Always use handrails while boarding or leaving the bus. 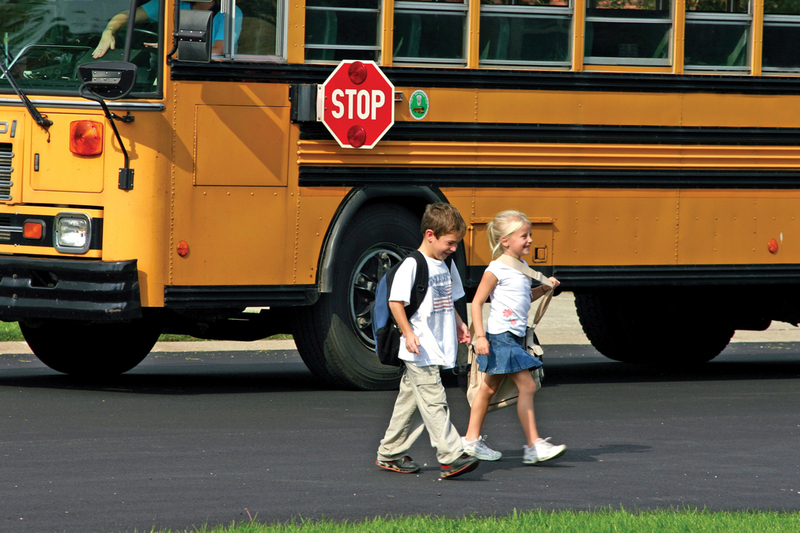 Drivers must always follow the speed limit and slow down near school zones and bus stops. 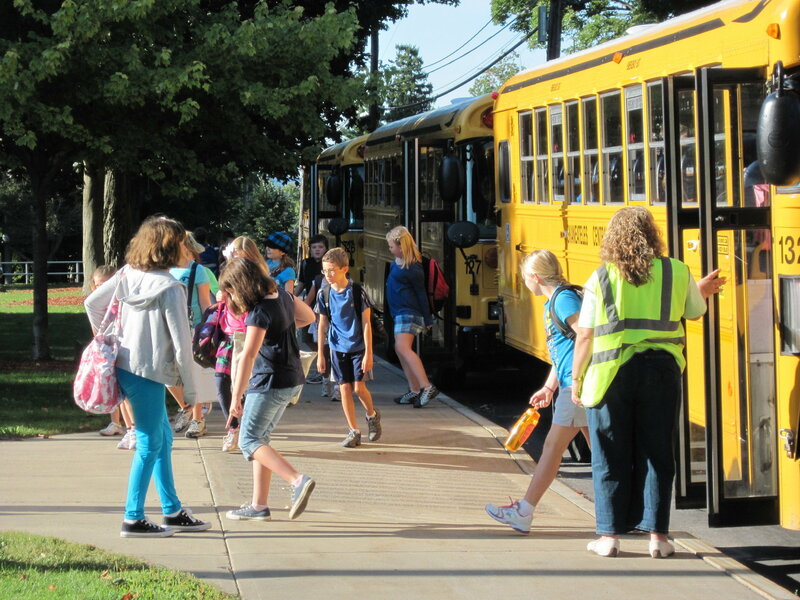 They should stay alert to watch out for kids who might be trying to board or exit the bus. Traffic must slow down if they watch a school bus with a blinking yellow or red light. It means that children are either boarding the bus or getting off. It’s a common question that everyone asks why school buses are yellow in color. If you noticed carefully, you will find that yellow is the most prominent color that gets your attention. Supposing if you were to look straight ahead, you can identify yellow color even through the corner of your eyes. Apart from it, a yellow color is easy to identify during a foggy morning or dim light conditions. Yellow with black letters or lining is easily identifiable than any other color combination. You might have noticed that not only school buses but other automobiles like earth-moving, outdoor and road-building machines are yellow in color as it provides safety and prevents someone from running into them. Most accidents happen because they reacted late in that particular situation. However, a yellow color gives stern warning amidst traffic. Scientists have found out that people are able to see the color yellow in the peripheral field 1.24 times more than red. Unlike any other color, yellow is the most visible color during the night or low light conditions. That is the reason; school buses are the most preferred option for parents to send their kids to school in a school bus. School buses are definitely the safest way to travel to and from the school. 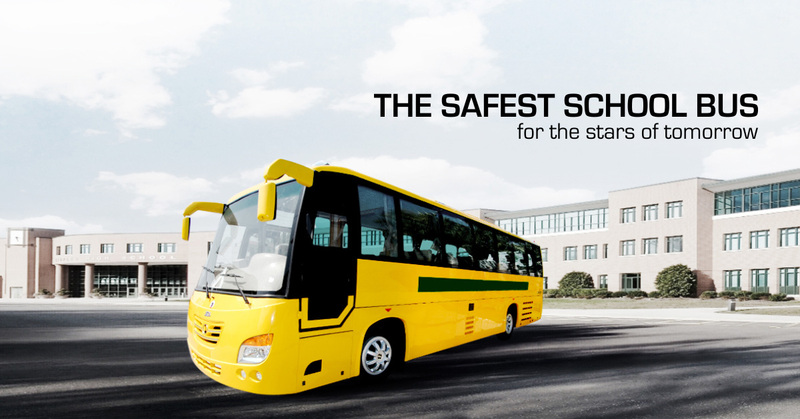 Built with a lot of safety features, school buses ensure the safety of your kids even though you are not with them. The drivers are screened during the hiring process to make sure that they are the right fit for driving a school bus. The drivers are well trained and take proper precautions during their trip back and forth to school. The school bus body parts manufacturers install appropriate fittings to make the school journey most comfortable for a kid. JCBL, a school bus company in India manufactures happy buses to meet the demand of school buses in India. The buses manufactured at JCBL facility are state-of-the-art, ergonomically designed and technologically advanced buses. The company has a line-up of nearly 5 exclusive models - Guide, Pride, Wish, Touch and Noble. The innovation, reliability and ergonomic designs have made JCBL be a leader in this industry. Every minute detail is taken into consideration to ensure safety and comfort for the kids who are ready to go to school and make their traveling experience a delightful one. So, what’s your choice of a bus to send your kid for a safe and comfortable ride to their school? Please add your comments below if you would like to add more information.